We spent the next leg of our trip in San Diego County. Initially, I was disappointed that we could not find a place to stay in Carlsbad on the Pacific Coast. Instead, we found a wonderful hotel in San Marcos, 11 miles inland. In the end, it was the place I liked the most of our stay. There were spectacular sunsets, and there was less traffic and fewer parking problems. It was also very close to Escondido, California, and the San Diego Zoo Safari Park. The setting of the park was nothing short of spectacular, and we actually preferred the Safari Park to the world famous Zoo. on the Pacific Coast Highway. When we got there we noticed that the conservation area was surrounded by furiously pumping oil wells. Then we noticed a drilling platform just a few miles offshore. The conservation area appeared to be little more than PR for an oil company. Needless to say this hampered our desire to go in for a swim. I asked around about the oil wells, and I was told that there were many from Newport Beach to Long Beach. Oil is apparently an important source of revenue for the city of Huntington Beach, where there is apparently even an oil pump in the city hall parking lot. Since we'd visited Coronado, Torrey Pines (fantastic hiking) and La Jolla beaches, it was time to take my crew to LA, and I'm so glad that we did. The J. Paul Getty Center in Brentwood, California, is not to be missed. The view of LA and the San Gabriel Mountains was breathtaking. Richard Meier's stunning architecture, Robert Irwin's central garden and Laurie Olin's landscaping made for an inspiring day. Taking my kids, particularly my 6-year-old, to a museum can be a difficult undertaking, as we discovered on our visit to LACMA last year. But my children were completely engaged at the Getty. At every turn, there was an impressive vista or fountain to see. There was also a children's sketching room and an activity centre. The collection was awesome, but my favourite was the photography section, a retrospective of Ed Ruscha's work. For anyone going to LA, the Getty is not to be missed. Oh yeah, admission is free, but there's a $15 parking fee--the best 15 bucks you've ever spent. because our children were itching to leave. This was more of a traditional museum where you're meant to go and look very closely at one or two things and then leave again. 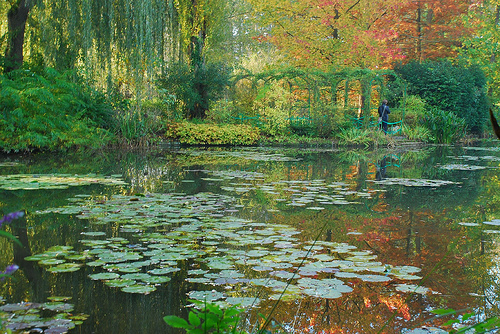 Fortunately, there was a lunch counter, which gave our kids something to look forward to, and a wonderful pond fashioned after Claude Monet's garden at Giverny. This was a great adult museum and shouldn't be missed. An added plus--admission and parking are free. We also visited Venice Beach and the Santa Monica Pier to see the sunset and visit the amusement park. Both were well worth the drive and traffic. Overall, our trip to SoCal was great, and on our next trip, we hope to go further inland and see the desert. I'm dying to see the Joshua trees. Related posts: LACMA: Mom Needs Fun Too! : Travelogue: Highlights of SoCalTweet this! I have yet to see the Getty Center, their photography section is awesome with collections of many contemporary photographers work that I really admire.